Since the day I first watched the Durarara!! Opening I loved Kida. When watching the first episode I thought he was pretty interesting and kind of crazy. After watching 3 episodes I was so interested that I started to search for the lightnovels and more information and completely spoiled myself. But it was great! I fell in love with the series and the character Kida Masaomi even more. 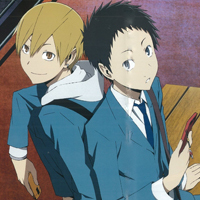 And Mikado and Masaomi are so damn cute together. 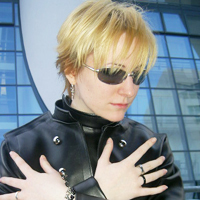 I was really happy when Kay decided to cosplay Mikado for me (I cosplayed Shizuo more or less for her too). It was so much fun to be Masaomi and be all hyper and stuff. Also our dear friend Fay was so cute as Anri and it was so much fun to be all lovey dovey with her, argue with Mikado and the best thing: Tell bad jokes all day long (mostly about Izaya >D). Yeah, Masaomi has a special place in my heart. 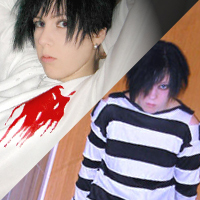 Next to Roxas he became my most often cosplayed character. Durarara!! - Shizuo & Izaya (school) What could be more fun as Izaya & Shizuo? Izaya and Shizuo in their Raijin days! Durarara!! 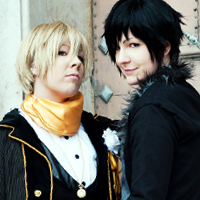 - Masaomi & Izaya (Kuroshitsuji Style) Masaomi and Izaya Kuroshitsuji Style! :D We liked both series, but the characters of Drrr!! more so we merged both. Gackt - Lu:na My favorite Outfit from Gackt of all time - Lu:na - completely made out of fake-leather!